Your enemy's castle has always been a thorn in your side, fueling the feud between you two for a long time. It is time to settle your differences, once and for all, and destroy that fortress in an all-out castle rampage! However, your opponent seems to have had the same idea, so now you have to defend your own castle, while still trying to raze the other one to the ground. Players start Castle Rampage by building their castle and its gate with their cards. Once a player has three cards in each of these locations, they can start attacking. Each round, they may draw a card from the draw pile, reinforce their castle with one card, then play additional cards to attack, first going after the opponent's gate and once that is destroyed the castle itself. Whoever manages to destroy the last defense card of their opponent wins. 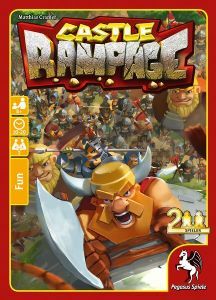 Castle Rampage is a quick and entertaining tower defense card game in which both players are the attacker as well as the defender. Each turn, they have to consider which part of their castle to reinforce and how many cards to play in order to tear down the opponent's castle walls as quickly as possible.